Summary: Budget combo of an exercise bike and an elliptical trainer from the respected We R Sports. This solves the puzzle of what to get for those who would like both. While you should not expect top-end features, you will get a LCD display, changeable resistance and an all-round solid machine for your money. Some solid (though not quite top-end) customer feedback over at amazon.co.uk too… check the product page to see this for yourself and to check out the (generous at the time of writing) discount. 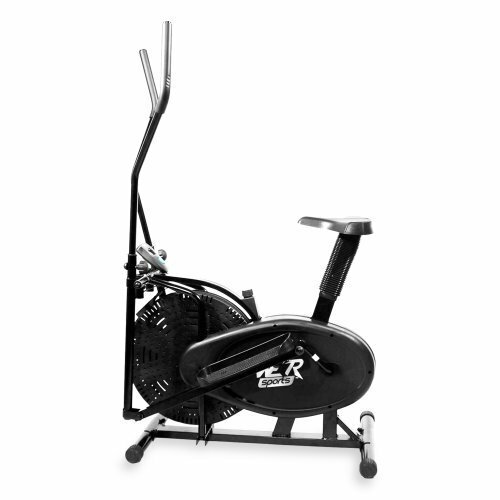 We R Sports 2-in-1 elliptical cross trainer is well designed and offers both biking and upper body exercise for a very reasonable price. While judging by the comments some buyers expected professional gym-level equipment for < £100, those who set the expectations to a reasonable level have been very happy with this machine. The often missed selling point of these hybrid cross-trainers / bikes is that you also double up on the space needed. You’ll get a solid machine, with tubular steel construction making it more robust than many of the aluminium models around. This one has an advised max user weight of just over 17 stone. There are not separate pedals and foot holders for the biking / elliptical motions – there are single foot holders which perform both functions. There is an on-board computer. This does not have programs (you really need to go above the budget level for these) though it does monitor time, speed, distance and calories burned. We R Sports say that this machine can burn up to 5 times more calories than just walking. While this is undoubtedly true, it does depend on how much effort you are willing to put into the elliptical and / or cycling! Whenever there is any putting together required, people grumble. This is the same for treadmills, rowers and just about any other type of home fitness equipment. My task is to compare all the reviews, and see if this is genuinely hard to assemble – or not. It feels like there are a lot of parts to work with, and an hour+ needed, though overall the consensus is that it is not hard to assemble compared to other similar models. I do have sympathy with those who are not mechanically minded here, while most people find this easy, I can imagine certain members of my own family struggling with even the easiest machines! For a budget end machine the We R Sports Bike / Cross Trainer gets solid feedback. Most of the 1 star ratings were for assembly or broken parts, rather than disappointment with the operation of the machine. One user did mention that it is a nice clothes rack, though there could well be some motivation issues there… Again, I really felt that it is expectation of what you’ll get at the budget end which was behind a lot of the negative comments. There seem to be many people who miss the point that the kit you see in the gyms will cost many thousands of pounds per machine, and that under £100, things are bound to be a little more ‘plasticy’. Hybrids are great if you are short on space, and ideal for those (individuals or families) who like to switch things up. We R Sports are respected for their budget to mid-range kit, and have a solid reputation for service too. Put these together with solid feedback, and a fat discount over at amazon.co.uk, and you have a machine worthy of anyone’s shortlist. Check out the full spec and latest discount for yourself over on the amazon.co.uk product page.